Maybe you’re not able to, or maybe you simply don’t have the time to read each little news blurb about Porsche Motorsports. If that’s the case, then Porsche Motorsport Newsletter here on PorschePurist is the best way to stay up to date. Filled with interesting facts and figures about past and upcoming races, along with changes to team and crew, the Porsche Motorsport Newsletter is an easy way to keep on top of this year’s racing activities within the Porsche community. The full update follows after the pictures. For the best experience click on Pictures of Porsche Motorsports to view the pictures using the “lightbox” function on our site. The Porsche youth development programme is running at high revs, and the seasoned Porsche works drivers are passing on their knowledge to the younger generation. Early in October, Patrick Long shared his experiences at the inaugural “Porsche Motorsport North America Driver Academy” with four selected young drivers. 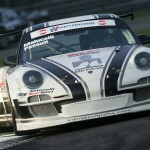 Patrick Pilet is mentor to the “Matmut Jeune Talent” programme in the Carrera Cup France. Timo Bernhard provided back up to the Porsche Juniors at three Carrera Cup Deutschland races as substitute for the regular junior coach Sascha Maassen. Denmark’s Michael Christensen celebrated a perfect finale to his first season as Porsche Junior: From pole position, the 22-year-old won the last race of the 2012 Porsche Carrera Cup Deutschland on the Hockenheimring (20/21 October). His Junior colleague Klaus Bachler (21) narrowly missed out on a podium spot by just-nine hundredths of a second. In the rookie classification Christensen and Bachler ranked second and third after their maiden season. Six young pilots took part in a final shoot-out from 29 to 31 October on the Autodromo Vallelunga to determine which two drivers will receive intensive support as Porsche Juniors in the 2013 Carrera Cup Deutschland. Levin Amweg (18) and Jeffrey Schmidt (18) from Switzerland, Dutchmen Dennis van de Laar (18) and Pieter Schothorst (20), Spain’s Alex Riberas Bou (18) as well as American Connor de Philippi (19) had come out on top after a selection process against international competition. The decision on the future juniors will be announced in the next weeks after analysing all information. After the Junior shootout in Vallelunga, nine drivers from seven Carrera Cups and the GT3 Cup Challenge Canada fought for the Porsche Motorsport International Scholarship: funding to the value of 200,000 Euro is supplied to contest the 2013 season of the Porsche Mobil 1 Supercup. Five newly-crowned Carrera Cup champions, RyoHirakawa (18, Japan), Alexandre Imperatori (25, CC Asia), Johan Kristoffersson (23, Scandinavia), Michael Meadows (25, Great Britain) and Jean-Karl Vernay (25, France) went head-to-head against top competitors André Heimgartner (17, Carrera Cup Australia), Kyle Marcelli (22, GT3 Cup Challenge Canada), Côme Ledogar (21, CC France) and Edoardo Piscopo (24, CC Italia). Porsche Motorsport will announce the winner in several weeks. After their second win of the season at round seven on the Fuji International Speedway (14 October) in the 911 GT3 RSR of Felbermayr-Proton, Marc Lieb and Richard Lietz climbed the podium in second in the GTE Pro class at the final in Shanghai (28 October). In the GTE Am class, Christian Ried, Paolo Ruberti and Gianluca Roda finished in second in a 911 from last year fielded by Felbermayr-Proton. The track record for the year: Three victories and four other podium results. Fifth place after a questionable time penalty cost Joerg Bergmeister, Patrick Long and their Flying Lizard Motorsports squad a podium spot at the ALMS finale in Road Atlanta (20 October) as well as the possible GT vice-championship. On the other hand, their works pilot colleague Romain Dumas had reason to celebrate. As a guest driver, the Frenchman provided support to Klaus Graf and Lucas Luhr in their LMP1 class title win. Porsche works driver Marco Holzer and Manthey-Racing pilot Nick Tandy won the 16th and final race in Barcelona (4 November) at the wheel of the 911 GT3 RSR of Manthey-Racing. After clinching their fifth win of the season, the German and Briton became vice-champions. The duo was just three points shy of the title. Second in the race on the Circuit de Cataluña went to factory pilot Patrick Pilet and his French compatriot Raymond Narac in a 911 GT3 RSR run by IMSA Performance Matmut. At the first race of the seventh and final weekend (27/28 October) in Le Castellet, Henry Hassid and Anthony Beltoise won the fight for the French GT Championship in the 911 GT3 R fielded by Pro GT by Almeras. At race two on Sunday, the champions retired with a radiator leak. Kyosuke Mineo and Naoki Yokomizo claimed their first win of the season in the 911 GT3 R of Endless Taisan at the finale on the Twin Ring Motegi (28 October), and took home the driver and team championships in the GT 300 class. For the Taisan team this marked their eighth title. The favourite Hankook-Porsche 911 GT3 R with Masami Kageyama and Tomonobu Fujii were not able to turn the pole position to their advantage at the rain race. Seventh place handed them runner-up honours for the drivers and the team. Finale of the Italian GT Championship in Monza (20/21 October): Victory for Matteo Malucelli and Christian Passuti in the 911 GT3 R of Antonelli Motorsport at race one. Race two goes to Alessandro Balzan and Giacomo Barri in the GT3 R of Ebimotors. Porsche factory pilot Marc Lieb shines at his guest start in the Australian V8 Supercar Championship in Surfers Paradise (19/21 October) with second place. At the penultimate race weekend of the Porsche Carrera Cup Australia in Surfers Paradise (20 /21 October), two wins hand Craig Baird his tenth title in a Porsche one-make race series. Title decision between René Rast and his teammate Sean Edwards at the final race weekend of the Carrera Cup Deutschland in Hockenheim (20/21 October). Rast finishes in seventh and wins the championship for the second time since 2008. Nicki Thiim wins the race. At the Macau GT Cup this coming weekend (17/18 November), seven 911 GT3 R as well as three 911 GT3 Cup line up on the grid. The most prominent Porsche pilot: Works driver Romain Dumas, who contests the city race in China at the wheel of the same 911 GT3 R with which he drove to second at the Pikes Peak mountain race. Other Porsche Blog Posts You'll Enjoy!